This Sunday evening, 171 million miles beyond its builders' ability to do anything but watch and bite their nails as they monitor events that happened 15 minutes earlier, NASA's appropriately named Phoenix spacecraft will slam into the upper atmosphere of Mars at a blistering 12,527 mph some 77.6 miles above the red planet's frozen surface. It's heat shield blazing, Phoenix will be subjected to a jarring deceleration of 9.2 times the force of Earth's gravity as it plunges toward the ground, using atmospheric friction to slow down enough to permit deployment of its main parachute at an altitude of 7.8 miles. 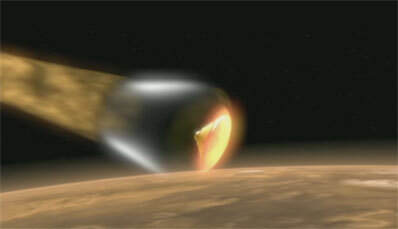 A few seconds later and one mile closer to Mars, the no-longer-needed heat shield will be jettisoned, the craft's three landing legs will unfold and snap into place and an altimeter will begin bouncing radar beams off the ground to supply critical altitude and velocity data to Phoenix's electronic brain. Within another few moments, the craft will be descending more or less directly toward the landing site, its forward velocity reduced to a relatively slow drift as it falls under its parachute. Getting to this point in one piece is a major technical challenge. But it is the final minute or so of Phoenix's descent that generates the most anxiety among flight controllers at NASA's Jet Propulsion Laboratory in Pasadena, Calif.
At an altitude of about 3,215 feet and a velocity of 125 mph, the 900-pound lander will fall free of its parachute-supported backshell and its computer will fire up 12 small rocket engines, pulsing them on an off as required to stabilize the craft, move it away from its now-discarded parachute and slow it enough for a successful landing. Settling to the surface, the computer will re-orient the five-foot-wide craft as required to ensure its solar arrays, once deployed, are properly positioned to maximize power generation. And then, if all goes well, Phoenix will drop to the surface around 7:53:52 p.m. EDT, Earth-receive time. Throughout the entry, descent and landing, data from the spacecraft will be relayed to Earth through NASA's Mars Odyssey spacecraft orbiting high overhead. But it will take those signals, traveling at 186,000 miles per second, 15.3 minutes to reach anxious flight controllers at JPL. They will be watching events that have already happened, powerless to affect the outcome. "I'm confident we have worked as hard as any group of people can," said Project Manager Barry Goldstein. "Am I confident in the landing? I'll be nervous. If my fingernails survive that day, it will be a miracle. It's not the things that we know that will hurt us. It's the things we don't know." A detailed entry and landing timeline is posted here. Assuming Phoenix makes it to the surface intact, it will vent pressurized helium from its no-longer-needed propulsion system and then simply wait 20 minutes for any dust kicked up by the descent engines to settle out. Then the lander's computer will send commands to unfold two solar arrays like giant circular fans covering 45 square feet to begin collecting sunlight and recharging on-board batteries. After that, Phoenix's main camera mast will be extended, along with a boom carrying meteorology instruments. But the Mars Odyssey spacecraft will drop below the horizon one minute after Phoenix lands and flight controllers will have to wait one hour and 50 minutes for Odyssey to swing back around the planet for a second communications pass to determine whether the arrays did, in fact, deploy properly and to assess the overall health of the spacecraft. Either way, Goldstein's nails are in for a rough night. The last time NASA attempted a rocket-powered descent to the surface of Mars, a $120 million spacecraft - the Mars Polar Lander - simply disappeared, the presumed victim of an overlooked software bug and a premature engine shutdown that likely resulted in a small, very expensive crater near the red planet's south polar cap. It was Dec. 3, 1999, and it was NASA's second Mars failure in a row, coming on the heels of an embarrassing metric-to-English conversion error that doomed the Mars Climate Orbiter three months earlier. The failures effectively ended NASA's "faster, better, cheaper" approach to planetary exploration - critics dubbed it "faster, better, deeper" - and prompted a sweeping overhaul of the agency's Mars program. 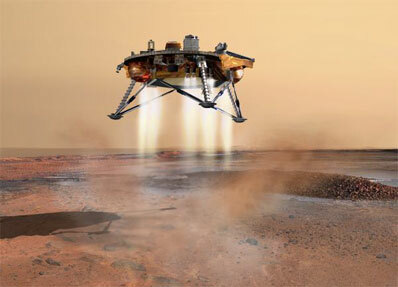 NASA originally planned to follow the Mars Polar Lander with a virtually identical rocket-powered landing craft in 2001, but that project was canceled. The appropriately named Phoenix project was approved in 2003. It was built by Lockheed Martin using hardware left over from the canceled mission in concert with an exhaustive test program to find and eliminate any possible issues that could result in another landing failure. In the meantime, NASA has successfully launched two orbiters to the red planet - the Mars Odyssey and the Mars Reconnaissance Orbiter - and two enormously successful rovers, Spirit and Opportunity, that are still in operation four years after landing in January 2004. They were designed to last just three months. With Phoenix, all that remains of the "faster, better, cheaper" approach is, engineers hope, the "better." The price tag for the Phoenix mission, including the Delta 2 rocket that boosted the spacecraft to Mars, is $420 million. The Canadian Space Agency chipped in another $37 million for the craft's meteorology equipment. "There are a lot of issues we had to face on Phoenix," Goldstein said. "We've been working for the last five years in testing this vehicle. There were a number of recommendations, over two dozen recommendations made by the various review boards. ... We've addressed each of these. In addition to that, and I would suggest more importantly, we've addressed and found other areas of concern that could have caused the loss of polar lander. There are over 12, of which one could be extrapolated into 12 more that we have found. "And so we feel we've adequately tested this vehicle," he said. "That being said, there are a lot of events (that have to go well)." NASA's Mars Pathfinder and the two Mars Exploration Rovers used parachutes and giant airbags to safely bounce to successful landings. But that was not an option for Phoenix, which is too heavy for airbags to be feasible. "We have to have an ability to land a larger payload on the surface as we try to expand the Mars program into larger and larger landing systems," Goldstein said before launch. "Eventually, there will have to be a landing system for people. They are not going to want bounce around in airbags. ... So this team has put an enormous amount of energy at retiring and finding all sorts of problems. We are very confident that we basically have retired everything that we can think of." At a news briefing last week, Ed Weiler, NASA's chief of science operations, provided a low-key assessment of the challenges faced by Phoenix. "Phoenix is truly an appropriate name for this mission as it has risen from the ashes of two Mars failures back in 1999," he said. "In '99, an identical lander named the Mars Polar Lander crashed on the south polar cap of Mars. This was the second Mars failure in a row in the Mars program of the late 1990s, the 'faster, better, cheaper' era. With both, we had achieved the faster and the cheaper aspects of that goal. But the better was clearly missing as all we accomplished were two craters on Mars. That is the negative side of the story. "In 2000, I canceled all remaining missions in that failed Mars architecture except the 2001 orbiter later named Odyssey. The canceled missions were the 2001 lander, an identical twin to the MPL, a sample return set of missions to be launched in 2003 and 2005. We then restructured the Mars program to attempt a mission launch every 26 months and focus the science to follow the water. One of the major goals of the current Mars program is to answer the question of whether life now or ever existed on Mars and we know that without water, there is no life. We also attempted to lay out a program and a budget to try to do a better job of equally balancing the goals of faster, better and cheaper. The rest is history as we've had four successes in a row: the Mars Odyssey, the two Mars rovers and the Mars Reconnaissance Orbiter. And that brings us to Phoenix. "We selected this mission through an open competition and peer review in the early part of this decade," Weiler said. "Dr. Peter Smith of the University of Arizona proposed to take the canceled spacecraft from the 2001 lander and fix its known problems and launch it to the north polar regions of Mars. The team has done everything possible to ensure a successful landing. But remember, although we've fixed all the known issues from the Mars Polar Lander, there are always unknown unknowns. And of course, there's Mars itself. "Fifty-five percent of all human attempts to land robots on Mars have failed. The U.S. has a better record, as we have succeeded in five of six attempts. But three of those five successes employed airbags. Viking was the last time we successfully used retro propulsion and landing legs. So it's been over 32 years since NASA has been successful in such a landing. And even then, Viking dropped its two landers from an orbiting spacecraft whereas Phoenix is coming in from deep space at a much higher entry velocity. "So, I hope that I've convinced you this is no trip to grandma's for the weekend," Weiler said. "There are many, many risks and uncertainties. But as someone once said a long time ago about NASA, we do these things not because they are easy, it's because they are hard. And the scientific payoff will be well worth the risk." 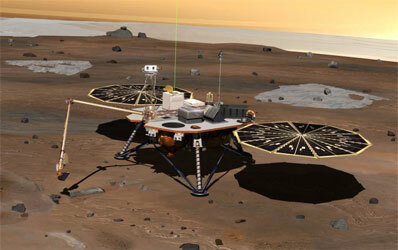 NASA's two currently operational landers, Spirit and Opportunity, are located on opposite sides of Mars. They have been studying the local geology to help scientists understand the role of water in the planet's past. The rovers have confirmed that water existed on Mars earlier in its history. Pictures from Mars orbiters clearly show huge channels and other features on the surface that almost certainly were carved by flowing water and there is evidence that Mars once featured a vast ocean in the northern hemisphere. Mars today is cold and dry, the presumed victim of an environmental catastrophe of some sort in the remote past. 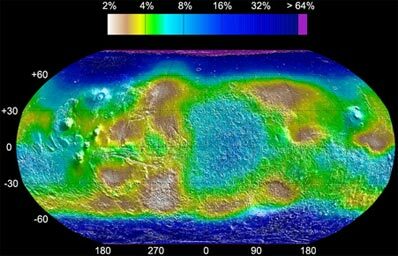 But the Mars Odyssey orbiter, equipped with an instrument that can detect evidence of water up to three feet below the surface, has discovered vast amounts of ice locked in the soil of the planet's polar regions, ice that could be the remnant of an ancient sea. Phoenix, equipped with a robot arm and a suite of ovens and other instruments to assess soil chemistry, was designed to land on that frigid surface, dig into the soil and directly sample the buried ice. "We can see actually to a depth in the surface to about a meter, or three feet," said Smith, the Phoenix principle investigator. "In the equatorial regions between zero and plus or minus 60 (degrees), we see that the water is less than about 8 percent in the soils. That's probably bound water, in other words it's attached to clays and various salts. But in the polar regions, from 60 degrees north and south, there is a very large abundance of water and it's almost mixed between, say, 30 and 60 percent ice-to-soil ratio. So we expect a tremendous abundance of ice in these northern plains. And in fact, our landing site is in the highest concentration of ice outside the permanent polar caps." The two Mars Exploration Rovers "went to study the past history of water and the discoveries they have made have been very successful in finding out where the water was," Goldstein said. "What Phoenix is doing is using a stationary lander and going to where the water is." "If we are successful, we'll be able to taste the water on another planet and tell humans what is inside that water." 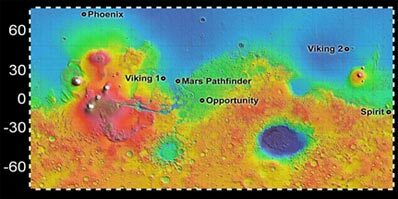 To help improve the odds of success, mission planners selected a landing site at 68 degrees north latitude, 233 degrees east longitude that is centered in a broad valley some 30 miles wide and 800 feet deep. High-resolution photographs from the Mars Reconnaissance Orbiter indicate a remarkably smooth surface with few large rocks that could cause a landing problem or interfere with deployment of Phoenix's solar arrays. "If you were standing there, in an area about the size of a football field, you'd be lucky to see two or three rocks bigger than one and a half yards across," said Raymond Arvidson, a co-investigator at Washington University in St. Louis. "So we've chosen a place that has very, very few rocks. The slopes are innocuous, very low. So from the point of view of relatively safe areas, this is very safe in a relative sense. One of the smoothest, rock-free areas on the planet. But scientifically interesting? Yes." 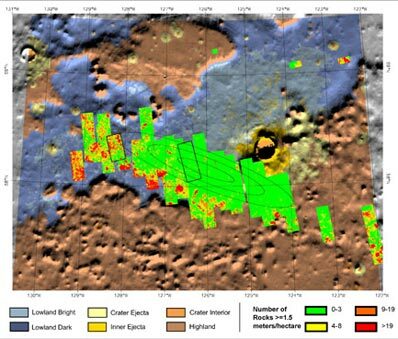 Based on the Mars Odyssey data, scientists believe ice is present five to 10 inches below the surface. Because of the ultra-low temperatures in the northern polar region, that ice likely will be as hard as concrete. But a powered rasp on the end of Phoenix's robot arm is designed to shave ice chips into a scoop for analysis by the craft's instruments. The aluminum and titanium robot arm measures 7.7 feet long and is capable of digging a trench up to about 20 inches deep. It is designed to scoop up soil, rock and ice samples and deliver material to analyzer intakes on the upper surface of the lander. One instrument, called the thermal and evolved gas analyzer, has eight small single-use ovens to heat samples up to 1,800 degrees Fahrenheit. Gases driven off by that heating will be analyzed by a mass spectrometer. Another instrument, called the microscopy, electrochemistry and conductivity analyzer, will use four different tools to do exactly what the name implies: study the small-scale structure, chemistry and electrical properties of soil samples. Meteorology instruments will monitor the martian weather at the landing site and cameras mounted on the robot arm, inside the experiment section and on the craft's main mast will provide the pictures necessary for guiding the arm and assessing local conditions. The main surface stereo imager will provide views roughly equivalent to what a human would see standing at the same spot. The instruments are not designed to detect life or direct evidence of biological activity. Rather, they are designed to assess the habitability of the planet, past and present. "We have not designed the instruments as life detection instruments," said Smith. "We are looking at the minerals and we have little ovens that heat the soil samples and as we get to temperatures where, say, a carbonate would decompose, we'll see a little puff of carbon dioxide come out and by analyzing the gases and the temperatures at which we see transitions, we'll be able to characterize clays, carbonates, sulfates and other types of materials that are formed through the action of liquid water onto volcanic soils. "So we're looking for the changes caused by liquid water. We also do an exepriment where we say what would the soil be like if the ice melted? Because we don't want to wait 50,000 years for that event, we actually bring a little water with us, wet the soil and we look at the chemistry of the wet soil. And that tells us about the kind of environment that would be available with melted ice and wet soil. Then, of course, our microscope looks at the shape of the grains and the clumping of the grains and the magnetic properties of the grains. "We're really doing a full geologic and chemistry experiment on the surface with the idea of finding if this is a habitable zone." But first, Phoenix must survive its descent to the surface and deploy its solar arrays and other appendages, critical events that will occur while the spacecraft it out of contact with Earth. When Mars Odyssey swings back around one orbit after touchdown for its first post-landing data relay pass, engineers will be eagerly awaiting the first pictures from the lander. "The first images the vehicle takes is of the solar arrays," Goldstein said. "Clearly, the most critical thing for us after touchdown is getting to what we call a power positive state, where more energy is flowing in from the solar arrays than we're consuming heating the vehicle and keeping the vehicle alive. So the first images we want to get down to the engineering team is the status of the arrays as they open. "If everything works well with the arrays and they open accordingly, we take several more engineering images, not the least of which being an image of the landing legs to see if they surface is actually as predicted and how deep we've actually penetrated into the surface. So we'll get images of that sort. We'll also take images of other critical deployments that happen at touchdown, including the deployment of the meteorological mast as well as opening of what we call the bio barrier, which protects the robotic arm during the cruise phase. So all those things should be available on the first downlink." Overnight, NASA's orbiters will relay health checks back to Earth but the next high-bandwidth opportunity for pictures is expected around 8 a.m. EDT Monday. The lander's robot arm likely will not be deployed until Tuesday, after temperatures stabilize. Phoenix is designed to operate at least three months. Goldstein said it's possible the spacecraft will survive longer than that, but unlike the Mars Exploration Rovers, which operate in more environmentally benign equatorial regions, Phoenix will eventually run out of power. At 68 degrees north latitude, the sun will dip below the horizon early next year and stay there for several months. The solar-powered Phoenix will lose power and die. While NASA will attempt to contact the craft after the sun rises again, "it's extraordinarily unlikely the vehicle could survive that," Goldstein said.